SUBHEAD: Utah just passed America’s first ‘Free-Range Parenting’ law fostering of child self-sufficiency. Image above: Older boy walking younger boy across road with no parental supervision. From original article. Utah has legalized a controversial child-rearing method known as “free-range parenting” that encourages the fostering of self-sufficiency in children from a young age, which is believed to be the first legislation of its kind in the United States. The so-called “free-range kids” bill was signed into law by Republian Gov. Gary Herbert on Friday after the state House and Senate voted unanimously to approve the legislation. 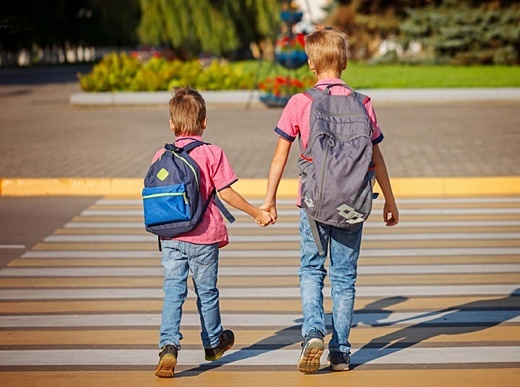 The new law, which will take effect on May 8, specifies that it is not a crime for parents to allow kids who display maturity and good judgment to do things like walk to school alone or play outside without supervision. An age limit was not defined, but the bill’s sponsors said it was left “purposely open-ended so police and prosecutors can work on a case-by-case basis” if abuse or neglect is suspected, according to The Associated Press. “If there are clear signs of abuse, obviously that is grounds for action, and in no way is excluded [from the law],” Rep. Brad Daw (R), the bill’s House sponsor, told the Salt Lake Tribune. Draw said he was convinced to pursue the legislation after seeing cases in other states of parents being investigated or even arrested for allowing their kids to do things alone. A Maryland couple made headlines in 2015 after they were accused of neglect for letting their two children ― aged 10 and 6 ― walk home without adult supervision. Sen. Lincoln Filmore (R), the Utah bill’s chief sponsor, said he introduced the legislation to encourage more self-reliance among children. “I feel strongly about the issue because we have become so over-the-top when ‘protecting’ children that we are refusing to let them learn the lessons of self-reliance and problem-solving that they will need to be successful as adults,” Filmore told Yahoo Lifestyle last week. Advocates of free-range parenting have celebrated Utah’s new law. “Yes, anything can happen. But I hate the idea that imagination becomes the basis of law,” she added. Free-range parenting is a method not without critics, however. Arkansas tried to pass a similar free-range kids bill last year but failed after receiving pushback from critics who said it was too dangerous to leave children unsupervised.